As I described back on the last day of October when I first cooked with broccoli Di Cicco, "it looks like broccoli raab/rapini, but after a little research on the web after cooking with it, I found it to be an Heirloom sweeter variety of broccoli; all parts are edible". I found broccoli Di Cicco in the store on Sunday and today came home well past 8p after teaching and interviewing two people, so wanted to make something quick. I had set my rice cooker to make brown basmati rice (I included a vegan bouillon cube with the water and rice). I made a simple stir fry, starting with finely diced onion, adding chopped apple-sage artisanal vegan Field Roast Grain Meat Company sausage a few minutes later, then adding the whole pieces of the broccoli Di Cicco. I didn't cook for long, just till the broccoli was cooked, maybe 3-4 minutes. Then I added a little Drew's Thai Sesame Lime dressing /marinade, salt, and pepper. Tonight a friend is coming over for dinner. We feel bad that he is so busy that he doesn't eat well. I have offered to drop meals off for him, but he hasn't taken me up on my offer. 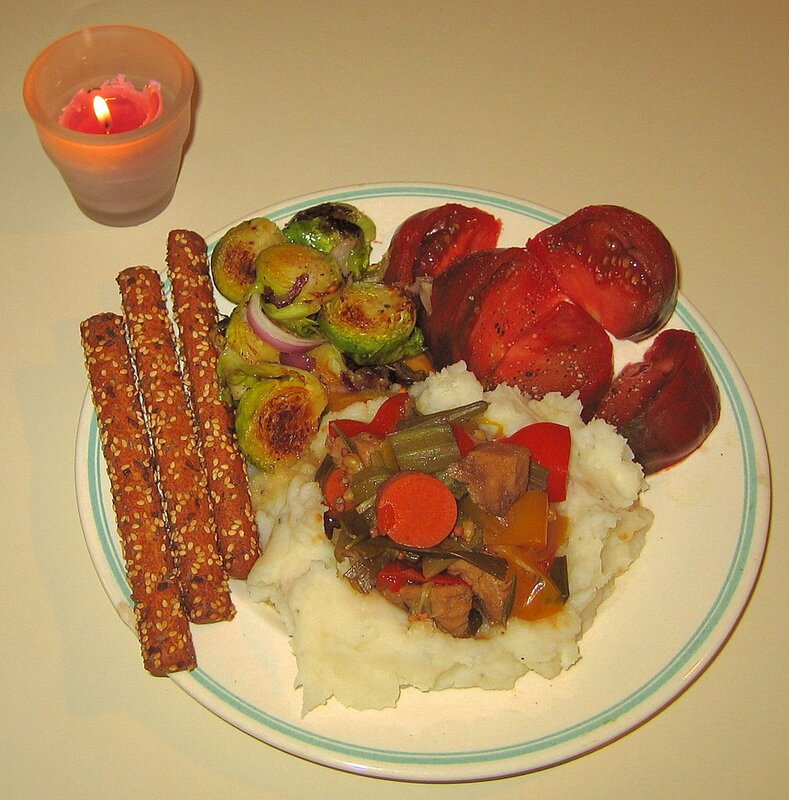 For tonight, he asked for a meal with lots of vegetables. Around 1p, I started the slow cooker going with (maybe 6-8?) Russian Fingerling potatoes cut into large chunks, medium diced leek (washed carefully - leeks often collect dirt), a small yellow bell pepper that I had diced into medium-small pieces, a half cup of hulled barley, a cube of vegetable bouillon, fresh herbs from my garden (maybe a tablespoon or a little more of rosemary and a teaspoon or so of oregano which, surprisingly, still exists above ground in my garden though it's been cold recently), about a teaspoon of grated ginger, 2 1/2 cups water, and a little salt and freshly ground pink peppercorns. The soup cooked till almost 8p (my friend said he would have enjoyed the barley more cooked, but my wife and I loved the soup and enjoyed the barley, cooked but still a bit firm). I made a saute of spinach with onions. 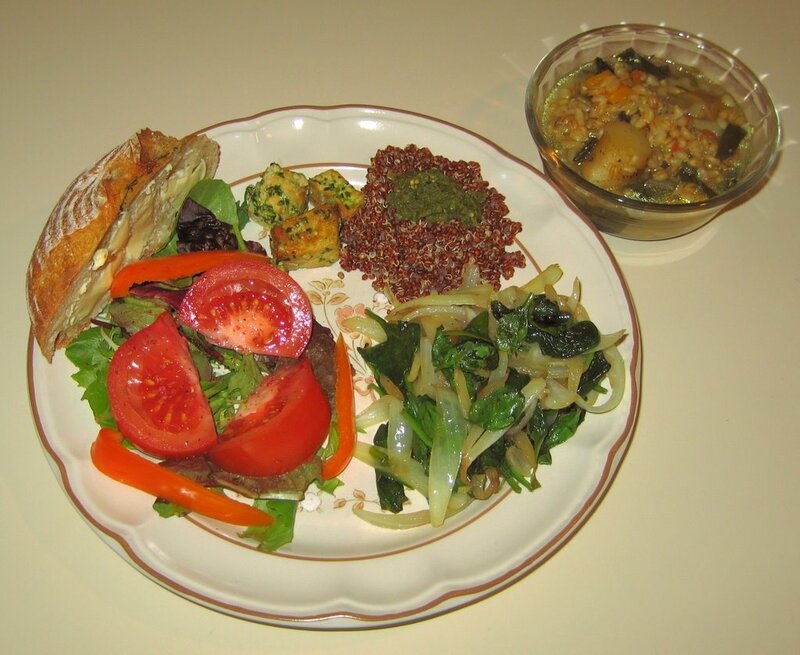 I also prepared a brownish-red heirloom quinoa (Ancient Harvest brand "Inca Red") simply, just by putting it in a pan with twice as much water, bringing to a boil, reducing the heat and simmering for a minute or two, then turning the heat off and covering the pan for about 15 minutes. I topped the quinoa with some tasty tomatilla salsa that we had purchased from Whole Foods, and also served some tofu with cilantro pesto (it's interesting that I didn't used to like cilantro at all but recently my taste buds have changed their minds! I think the thing that precipitated this may have been some of this tasty tofu that I sampled last year). Yesterday I was planning a meal, but my Mom and Dad had a get-together at their home and invited us to eat with them. We had some of the best okra that my Mom has ever made, as well as other good Indian dishes. 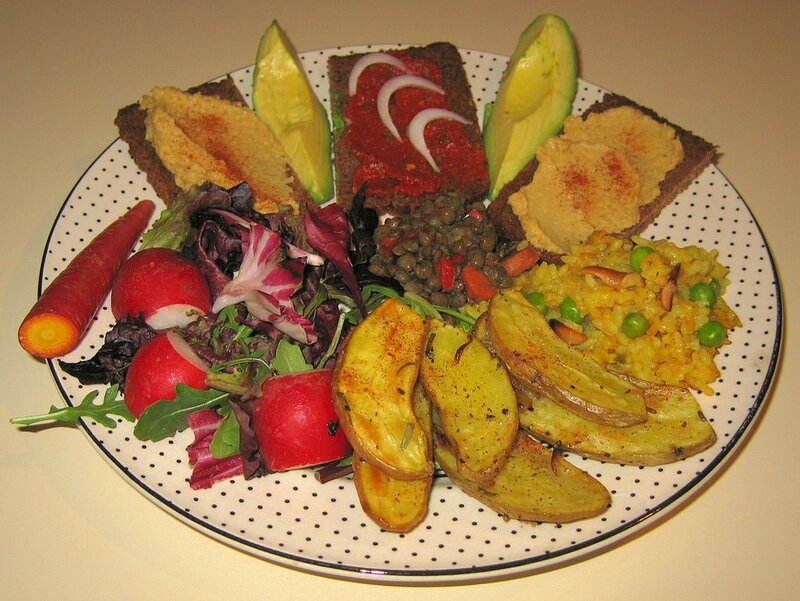 On Saturday, we had one of our best vegetarian society potlucks with around 30 people in attendance (including one person who just moved here and immediately recognized me as having interviewed him at a human-computer interaction conference in Minneapolis in April 2002!) and very good and ample food. I made a rice and tempeh dish for that event. Though I'm not a big fan of winter, one thing that I enjoy about the cold weather is the abundant citrus that we get from warmer climes at this time. Yesterday, I was delighted to see Page orange (actually a tangelo) availability, and had a big glass of its freshly squeezed juice with breakfast today. The more tart Minneola tangelo is my reigning favorite citrus, but maybe I should switch to Page; it is so sweet, that it seems like somebody has mixed sugar in to its juice! Of course, I also like the Pixie tangerine, which should become available in another month or so. I love the color of the Blood orange (and Ciao Bella brand Blood orange sorbetto is divine! ), but its more acidic and slightly bitter juice keeps it from being a favorite taster for me. For tonight's dinner, I quickly grilled in a little bit of , Sweetwater Growers' infused roasted garlic rosemary oil, slices of Italian eggplant. I lightly toasted seeded ciabatta (Italian "slipper" shaped bread), spread it with leftover sauce from yesterday, and some "cheddar with chives" vegan "sheese" from Scottish manufacturer Bute Island Foods (skipping the "sheese" on my wife's - she didn't like cheese or cream even before she was vegan), then topped it with the eggplant. It was a delicious combination. I also served Lundberg Jubilee® rice (Sweet brown rice, short and long grain brown rices, and black japonica) cooked with vegetable bouillon (it smells so good as it cooks!). 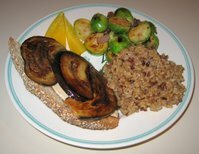 Some sweet bell pepper and grilled Brussels sprouts completed the meal. Yesterday was my photography class, so we ate out. We were rather disappointed with an unexceptional Greek buffet dinner that we had at a Chapel Hill restaurant. Tomorrow is a potluck dinner, so I probably won't have another blog entry until Sunday. I received a comment on the blog today that my friends (I know the very nice husband and wife owners - in fact, they want to carry my cookbook) at Vegan Essentials are now carrying sheeese! I have some samples of additional flavors; when I open them, I'll be sure to describe what I think of them. By the way, my wife and I discovered a delicious, big, soft cookie last summer - certified vegan, artisanal, fair-trade, mostly organic, Liz Lovely cookies. We can't get them locally, but Liz and her husband Dan sent some for our annual Thanksgiving raffle. Yesterday they sent me a nice sized box of samples to get my feedback, get samples to some others (I'm going to take some to a potluck dinner that the vegetarian society has tomorrow), and get leaflets to some area stores. We have begun to sample their oatmeal / walnut / chocolate "cowboy cookies" (my wife loved them and I thought they were quite good; like most of their cookies, they have a thin coating of luscious dark chocolate) and "peanut butter classics" - I like the whole peanuts and the overall flavor. Picking up on my description of the sauce I started yesterday, my wife started the slow cooker around 9:15a. All day, the house smelled good, though not as good as last time - I think I had less fresh oregano (it is winter, afterall!) and perhaps too much shallot. The smell became even nicer at about 8 hours, and I wish that we didn't have to eat (we went out to an 8p film tonight) a little after 6p - the sauce had 9 hours to cook and tasted quite good, but I suspect would be even better after an additional hour or two. The pasta itself was very interesting! I have never eaten trofie pasta before - it had a nice, chewy texture and the sauce was just right for it, not too thick and not very runny. 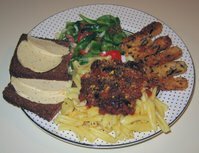 The assembled pasta, along with a little Eat in the Raw's Parma! vegan "Parmesan cheese" (high in B vitamins, iron, Omega-3 fatty acids, and trace minerals, and made from raw organic walnuts, Red Star nutritional yeast, and Celtic sea salt - "and love") sprinkled atop, tasted quite good, though I think that last week's sauce was significantly better. I also served green beans in a style that we had in Toscano in October - lightly sauteed then with lemon juice and salt mixed in (I didn't have a fresh lemon, but used Volcano Lime Burst -- water, organic lime juice, and lemon oil). I wonder if there's a risk of bacteria by letting the cooked shallot and garlic sit unrefrigerated in the raw tomatoes overnight. The idea of sauteeing garlic first thing in the morning is not at all appealing; I could refrigerate the slow cooker container and allow extra time, maybe an hour, in the morning for it to return to near room temperature before turning the heat on. I can't wait to make yet another delicious sauce with the slow cooker! By the way, I found a company called Blurb tonight that makes bound books out of, among other things, blogs. Their blog books don't yet support Blogger, but they do have plans this year to do so. I could easily, they claim, publish a book based on my blog entries here and wonder if that might be a good thing to consider. I am teaching a new course on Gandhian philosophy that began yesterday, but it is in the afternoon so shouldn't affect my cooking. However, tomorrow a 6-week photography class begins, so my wife and I will probably eat out those Thursday nights. I thought that I would make a Thai stir fry dish with rice noodles tonight, including some raw vegetables, particularly mung bean sprouts and possibly (though I opted not to) some diced tomato. I also included delicata squash, which in hindsight I wasn't crazy about (I didn't like the sweetness it added to the dish). I sauteed sliced fingerling potato, adding several minutes later a diced red onion and several cloves of garlic, ginger, and then a few minutes after that, delicata squash, a little bit of tempeh, sweet pepper, and mushroom. In the meantime, I soaked rice noodles in hot tap water for 5-10 minutes till they were soft, rinsed in cold water, and drained before adding them when the rest of the stir fry was almost done, stirring in the mung bean sprouts, soy sauce, and hot vinegar-based sauce a minute later before removing from heat. A little bit of chili powder (I wish I had hot pepper, but I don't) and freshly ground black pepper was the prelude to serving. 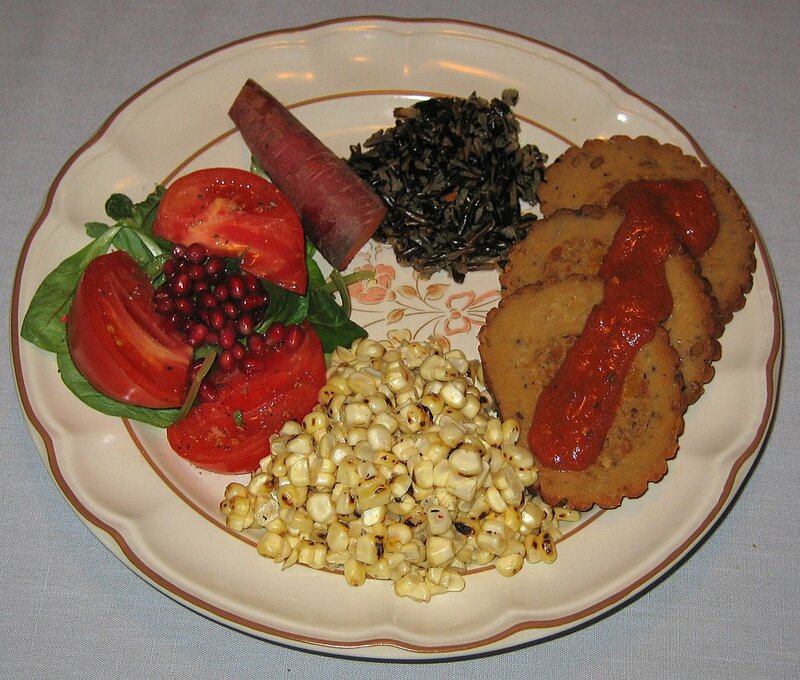 The dish came out well, though next time I make something like this, I would leave out the delicata squash, include a hot pepper, and serve the crispy sprouts on top on the plate, and not mixed in, however briefly, over the heat. It was good and filling! I also put material in the slow cooker for tomato sauce - I am looking forward to trying some trofie pasta ("La Pasta Del Marchesato") from the southern Calabrian region of Italia tomorrow. It takes approximately 14 minutes to cook and is shaped like thick little rolling pins, and I purchased it a few days ago. Like I did last week, I took firm but ripe roma tomatoes, seeded them, and cut them as finely as I could. I learned last week that I need more than 4 tomatoes; I used 5 quite large ones. Like last time, I briefly sauteed finely chopped garlic (maybe 3 cloves) and two medium sized shallots. I put all of this in the slow cooker, and mixed in about a teaspoonful of fresh oregano (I'm happy that it's still available this far into winter in my herb bed! ), 1/2 or slightly more teaspoon dried basil, a few tablespoons of extra virgin olive oil, a few shakes of salt, and a little freshly ground peppercorn. I've asked my wife to turn the cooker on "low" around 8a in the morning, and will plan to eat around 6, to give the sauce about 10 hours to cook. I can't wait for the lovely smell tomorrow! 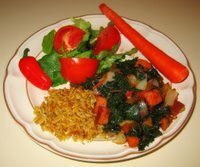 I was inspired by a recipe that I saw for Spicy African Kale and Yams (yams and sweet potatoes are different) to make this variation. I washed red kale leaves and coarsely tore off pieces, very roughly 1 1/2" or so squares, from the central rib. I also diced an unpeeled sweet potato fairly small into maybe 1/4" x 1/2" pieces. I steamed the sweet potato and kale for about 11 minutes. In the meantime, I sauteed large chunks of onion. After a few minutes, I added some diced garlic, ginger, and red jalapeno. When the onion was starting to brown, I added some cumin seeds and sauteed for another minute or so. I combined the contents of the pan and of the steamer into a bowl and mixed in salt, paprika, and Jamaican Pickapeppa sauce. 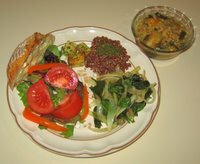 I served this with brown basmati rice that I had cooked with a vegan bouillon cube, and included a sweet red pepper with a salad. The main course was good and quite unlike anything that I've made. I would make it a bit more spicy if I were to make it again. We had stew leftover from last week; I reheated it on low for close to an hour, adding in some ginger and red jalapeno pepper, as well as cut green beans and peas. I served this atop Ramen noodles. My wife made some usal, as described in September when she made it then, as well. Yesterday we were away a good part of the day then decided to dine out as we were going to a 9:30p film. We ate at another of Giorgios Bakatsias' restaurants (we love Café Parizäde, where I host the country's largest vegetarian Thanksgiving), Grasshopper Asian Kitchen and Bar, a Thai restaurant. It seems to be getting more difficult for vegetarians to eat at Thai restaurants as fish sauce is still commonly used and for us vegans, some restaurants are unfortunately now diluting their coconut milk with half and half. At Grasshopper, the chef kindly came out to chat with us and told us most of their sauces had fish sauce, but we told him we loved tempeh, which he had, and let him put something together for us. My wife had stir fried vegetables and tempeh with rice, and I had a similar dish but served on crispy fried rice noodles. We both enjoyed our meals - including a very tasty pumpkin soup. Celebration Roast with Lime-Pepper "Gravy"
It's been almost eight months since I've used the tasty Field Roast handmade stuffed (with apples, squash, and mushrooms) Celebration Roast, a tasty non-soy vegan delicacy. I recently picked up two roasts, and used one today - what better way to celebrate the fact that we had a friend visiting us for dinner. The roast is simple to prepare and really only needs heating for about 15 minutes at 350°F. I then sliced it and drizzled on a gravy that I made by simply mixing a little Drew's Thai Sesame Lime dressing /marinade into the remaining hot red pepper spread that we had left. The dressing was quite tasty, and the roast was fabulous! I also roasted corn and served it with Earth Balance margarine, Volcano Lime Burst (water, organic lime juice, lemon oil), salt, and a little bit of freshly ground pink peppercorn. I haven't made wild rice in many months and today tried making it in broth - I served that, as well as a salad, too. Picking up from yesterday's description, the sauce turned out great! I started the slow cooker going around 3:30a and woke up to a fabulous smell! I had read that the sauce tastes great cooked on low for 10-15 hours, the longer the better, but I let mine go till around 6:30p, or 15 hours and found the edges of the sauce to be slightly burnt. It tasted GREAT with the burnt flavor only slightly distracting - I can't wait to make a tomato sauce again! Next time I may go with a 10-hour cook time. 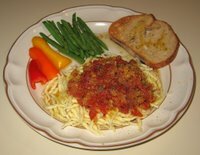 I served a good-sized portion of strozzapreti pasta and found that the sauce cooked down enough that it was barely enough, so next time I may throw in an additional tomato or two. My wife and I both loved the pasta. 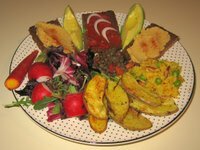 I also tossed a salad with oil and vinegar, and served pumpernickel bread with Isle of Bute Foods' vegan cheddar with chives "Sheese". I sauteed finely chopped red onion for a few minutes, cooking the pieces down a bit, then added finely diced shallot; a few minutes later, I added asparagus cut into approximately 1/2" pieces. In a nonstick sauce pan with a little bit of oil, I quickly stir fried jasmine rice for about a minute, adding a little cumin seed in the last 15 seconds or so (cumin can burn easily), then added 1 1/2 times as much water as rice, 1/2 a cube of vegan bouillon, a pinch or two of salt, and a small pinch of turmeric. I brought this to a boil briefly then, covered, simmered for about 20 minutes. The liquid was then nicely absorbed; I then mixed in the asparagus saute, freshly ground black pepper, paprika, and Volcano Lime Burst (water, organic lime juice, lemon oil), and, off-heat, left it to steam a bit in the covered pan for another minute or two. I served the pilaf with a arugula salad and Easter Egg radish, along with a dollop of guacamole (I love making guacamole; this small batch was purchased today). I also made toast out of rosemary sourdough bread with spicy red pepper spread, topped with an heirloom tomato slice. We loved the rice! I might try making a dish like this again, but add a little bit of ginger, and maybe mix in some sesame seeds just before serving. I am going to experiment with using my slow cooker to make a simple slightly chunky tomato sauce for pasta. Of course, Italian sauces taste great as they get to simmer for hours, and I read that one can cook sauces on the low setting of a slow cooker for 14 or 15 hours, and perhaps longer! Tonight, I took 4 firm but ripe roma tomatoes and cut each in half through where the stem had been attached. Then, with a paring knife, I cut out the core, seeds and interior membranes, and popped this flavorful and juicy treat into my mouth . I diced the remaining tomato as finely as I could, and put into the slow cooker. I also sauteed finely chopped several small shallots and 3 small cloves of garlic, and added that to the cooker, as well as a few tablespoons of extra virgin olive oil, a few shakes of salt, a little freshly ground peppercorn (I should start using the term peppercorn instead of black pepper as I often use items like pink peppercorns), maybe 1/2 teaspoon dried basil, and maybe a teaspoon or so of fresh oregano. I'm planning on turning the cooker on late tonight or early tomorrow morning, and making a simple pasta for dinner with this sauce. I also want to explore making other sauces, perhaps including some wine, sauteed vegan "sausage", maybe a touch of sugar or hot pepper, possibly olives or capers, artichoke pieces, and/or maybe some sauteed vegetables other than just onions/garlic/shallot. 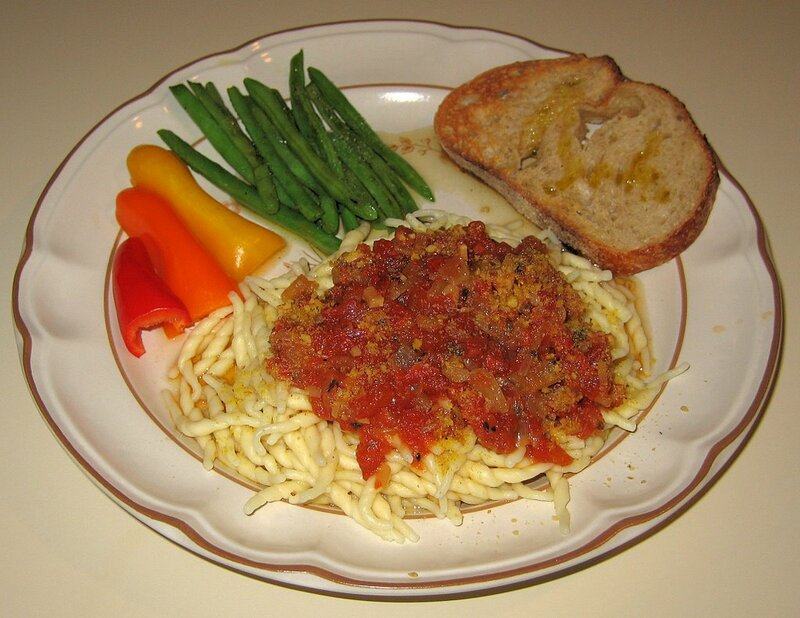 A friend used to add carrots to his tomato sauce, and that would also be worth experimenting with! But let's see how this sauce turns out - it smells good so far! I didn't have much time tonight and made a quick stop at a grocery store on my way home. I was surprised that they had Portugese rolls that were vegan; I went to graduate school in Providence, Rhode Island, where there is a large Portugese community with their yeasty rolls readily available, but they seemed to always have eggs in them. So I purchased Portugese rolls and had them for the first time in tonight's dinner (my wife liked hers, but I found mine too bland. 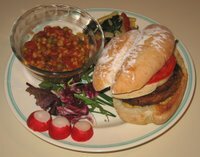 I simply grilled a Southwest Organic Sunshine Burger and served it on a Portugese roll with a little hummus, tomato, onion, and Isle of Bute Foods' vegan "Scheese"/"Sheese" (cheddar with chives). I also reheated the tomato barley soup that I had made a few days ago, as well as the little pasta with kale and sundried tomato that was also leftover. I had a number of leftovers and decided to use the pilaf and lentils that I had from the first of the year (almost two weeks old, alas, but still in good shape). I heated those in the oven, and also used some hummus and a spicy red pepper spread, both from my birthday a few weeks back, spreading atop hearty, dense whole grain Mestemacher Pumpernickel bread. Also, similarly to what I did on December 28, I made roasted Russian Banana Fingerling potatoes. I sliced the potatoes in half, lengthwise, and, along with chopped rosemary from my garden and cippolini onion (a small Italian onion available in the fall, and also called Borettana onion), I tossed with Sweetwater Growers' infused roasted garlic rosemary oil, salt, and fresh ground black pepper, and roasetd, cut side up and in a single layer, in a 425°F oven for a little over half an hour. I sprinkled some paprika on the potatoes (and hummus) before serving. I love the taste and appearance of purple carrots and was surprised to find them when I made a quick stop at a conventional grocery store yesterday next to the facility where I exercise. When I checked out, the store's registers didn't have the purple carrots listed, so the manager just gave me the bunch for free (though I told her what I thought the cost was)! I added a purple carrot to the salad that rounded out the reinvented leftovers. Today was quite interesting; my slow cooker saved the day! When I was preparing my dish for the dinner at our friends' last night (I made a Thai noodle dish with tempeh and vegetables), I went ahead and chopped into large chunks ingredients for a stew - seitan, okra, carrot, spring onion, yellow and red bell pepper - and put it all, plus water and some salt and pepper, into the slow cooker container, which went into the refrigerator. Then at 9a this morning, I took the container and put it into the slow cooker, cooking on low heat all day for a projected 8p dinner. Normally, I also include potato chunks, but I ran out of space in the slow cooker! Maybe I've already graduated to using a normal sized slow cooker instead of a 1.5 quart one. Well, when we came home at close to 8p after being out since a little after noon, the whole neighborhood had lost power (around 7p I heard), which almost never happens. We came home, of course, to the smells of hot stew, waiting for us! 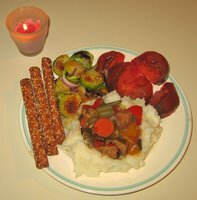 I hastily worked by candelight to make a mashed potato "bowl" to hold the stew (which still didn't compensate for not having potatoes in the stew, which I'll have to make again - it was reasonably good but could have been better). I also put very little oil in my cast iron pan and roasted Brussels sprouts and Italian Cippolini onions, and served Suzie's brand spelt multiseed breadsticks. Around 9p as I was finishing cooking, the power came back on! As I mentioned on Wednesday, we had dinner out as planned the last two days. 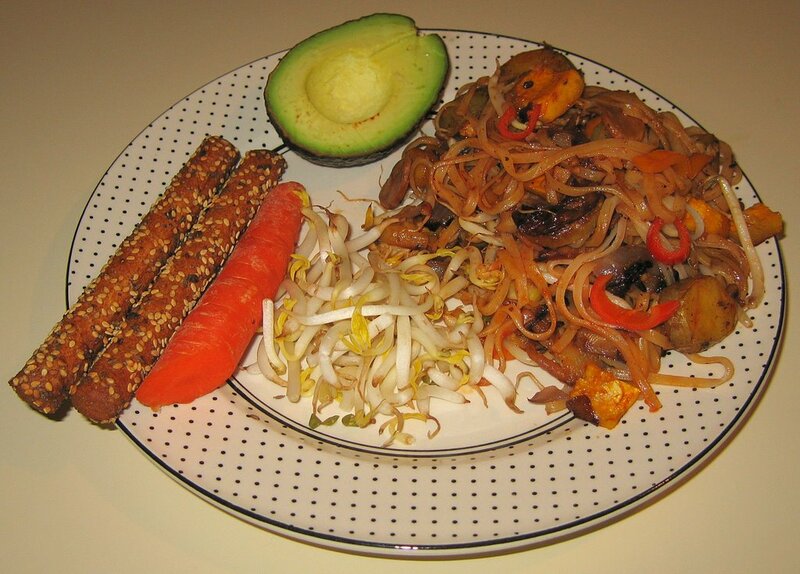 Yesterday we had a nice visit with some friends who made side dishes and dessert; I brought over a rice noodle dish with tempeh and vegetables. On Friday, we went to Winston-Salem to attend the funeral of a friend (Anne Weaver, founder with her husband Wes of the Very Vegetarian Society); as we expected, we ended up at California Fresh Buffet, a place with good, well-labeled food that Anne had introduced us, remarkably almost exclusively run by volunteers with all profits going to charities. Tonight, I have a photography meeting at 6:30, so thought I'd try using my new slow cooker. I used as guidance a Better Homes and Gardens Vegetable Barley Soup recipe but came up with my own version. Into the 1 1/2 quart slow cooker, I put 1 1/2 cups water, a 14 1/2 ounce can of fire-roasted diced tomatoes with green chili, 1/2 cup green peas, 1/2 onion sliced into thin half moons cut in half, 1/6 cup hulled barley, 1 cube Rapunzel brand vegan low-sodium bouillon, about a tablespoon of chopped ginger, some fresh oregano and rosemary from my garden, and a little salt and freshly ground black pepper. I didn't get started till around 3:15p; it would have been good to have cooked on low heat for 9-11 hours, but with a goal of eating at 9, I am using low heat for the first 2 1/2 hours then, around 5:45, plan to increase to high heat. If it turns out looking reasonably hardy, which I think it will, I'll probably serve this with toast and salad. My wife loved the soup and found it quite hardy; I thought it was reasonable, but would have benefited from having additional vegetables like potatoes and maybe corn. 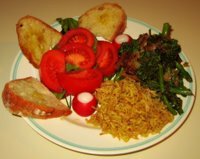 We both really liked the chewy barley; in a similar recipe, I would next time double the amount of barley and perhaps cut back the tomato by a little bit. We had some delicious spicy red pepper dip leftover from my birthday party on December 30th. 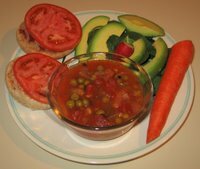 I spread the dip thinly on each half of a wheat English muffin, and topped with thinly sliced raw onion and slightly thicker sliced tomato. 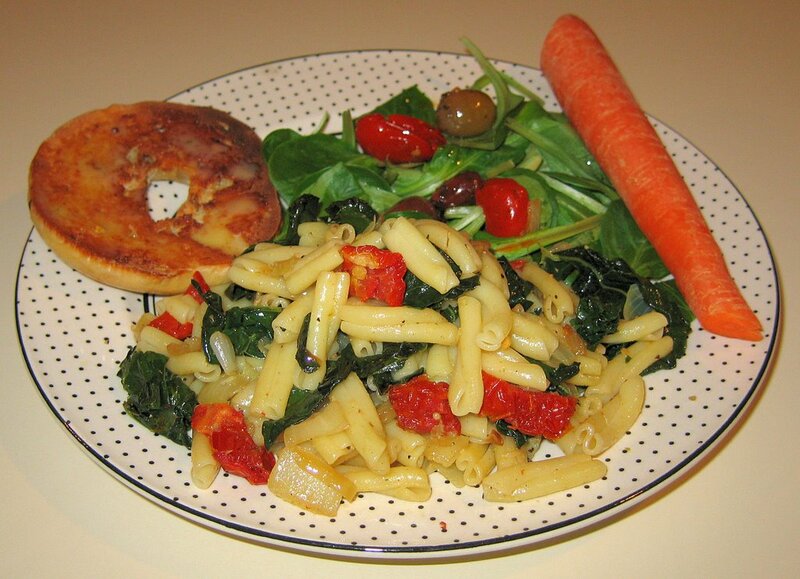 I was inspired by a recipe that I received from April Ashcroft of the Vegetarian Society of Utah this past Saturday that suggested sauteeing greens with sundried tomatoes and serving with pasta. 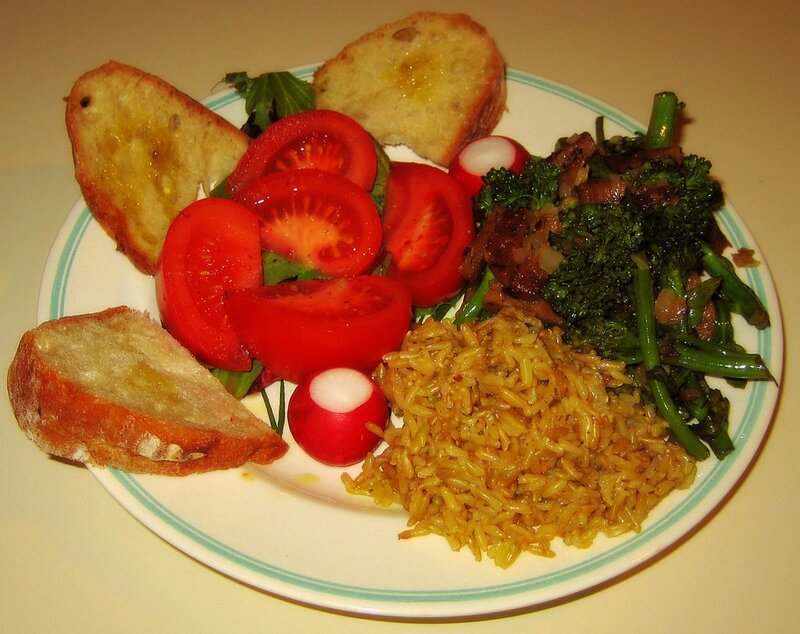 (They adapted the recipe from Andrew Weil's 8 Weeks to Optimum Health book.) Based on that recipe, I made a few changes and came up with what proved to be a tasty dish. I used strozzapreti pasta from the same Montebello Monastery in Marche, Italy that makes the "conchiglie" pasta I so love. It comes from the Romagna area of Italy and is twisted like a rolled towel, holding sauces and ingredients better than uniform and smooth spaghetti. I started by dicing a yellow onion into fairly small pieces, less than half-inch squares. I sauteed the onion in a large saute pan till clear, maybe 5-6 minutes. In the meantime, I washed lacinato kale and, leaving the middle ribs behind, roughly shredded off pieces, maybe 1" in square. I also had been soaking sundried tomatoes in warm water. When the onion was ready, I added the kale. 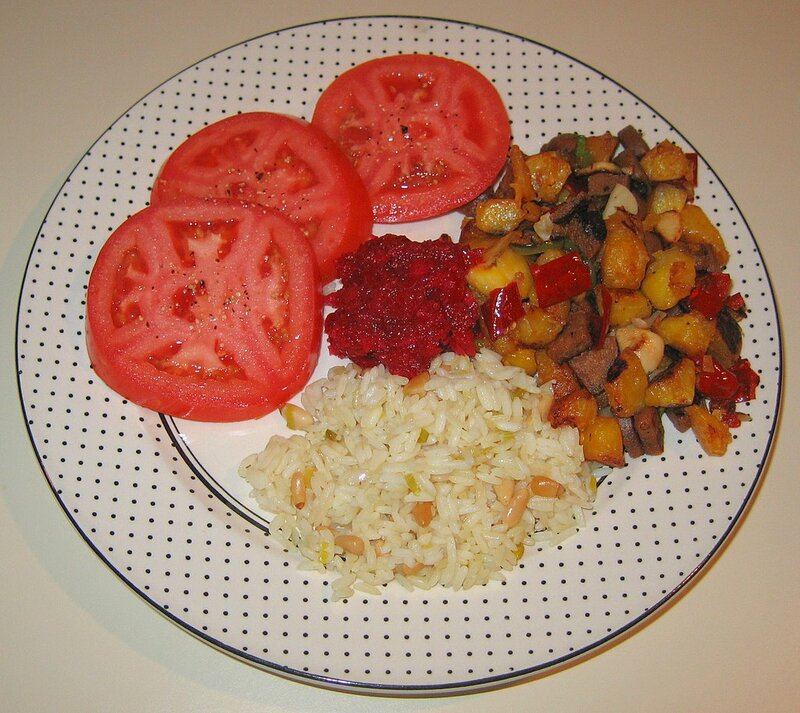 I drained the tomato and cut into thin slices, and added those slices to the pan. I pressed three small cloves (not whole bulbs!) of garlic into the pan, and added a little salt and freshly ground black pepper. I would have added some capers, but am currently out. I stirred and cooked for just a few minutes, making sure the kale wilted a bit. The pasta was on its 8-or-so-minute boil; I drained the al dente pasta then mixed the contents of the saute pan into the drained pasta. I mixed in some Eat in the Raw's Parma! vegan "Parmesan cheese" and served. I had considered quickly toasting some pine nuts and tossing them in, but we were hungry so I just got my photograph and we ate. We really enjoyed the pasta! I'm glad to have discovered strozzapreti pasta. I'll experiment with some pesto or tomato sauces in the near future. I received sad news today about death this past Sunday of a friend of mine, Anne Weaver. She and her husband of 63 years founded the nearby Very Vegetarian Society of Winston-Salem in 1990. They have organized monthly events and published a quarterly newsletter, influencing many people especially about the health aspects of a plant-based diet. They never missed the annual Vegetarian Summerfest conference! Anne was 85 years young. My wife and I are planning on attending the funeral on Friday and will probably eat out, maybe at California Fresh Buffet (wide selection, clearly marked and good choices for vegans, very clean, and, remarkably, run with nearly 100% volunteers and with all profits going to charities). Tomorrow I have a 6:30p meeting, so may have a quick very early dinner or a late one; Saturday we are invited to some friends' home. So my cooking will be a little slow in the coming few days. It seems like forever since I've cooked! On Saturday, I was running late for a concert (which ended up being sold out, alas) and was in a bit of a mood for falafel so, though I remembered that we only have one restaurant that I've found in the area (Neomonde) that makes reasonable falafel, I ate at Mediterranean Deli in Chapel Hill. I was disappointed then as well as on Sunday, when I ate at Thai Cafe in Durham; it was difficult finding anything vegan (why are more Thai restaurants diluting the use of coconut milk and mixing in dairy half and half??) 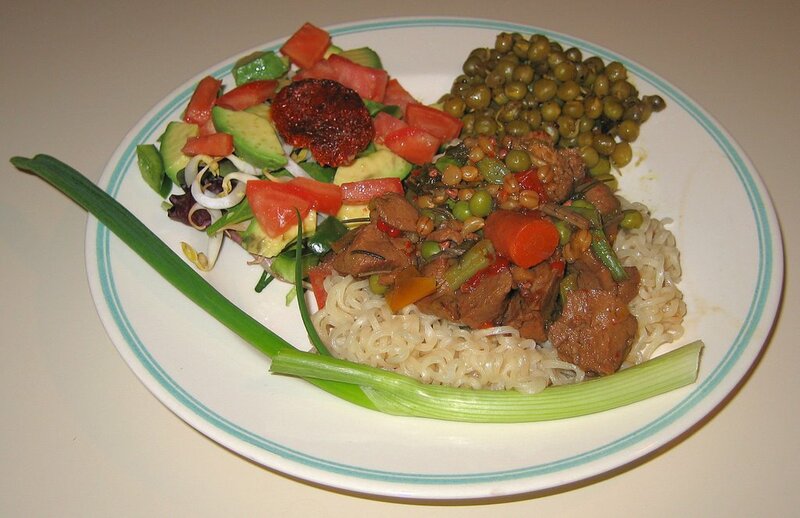 and the "veganized" noodle dish was uninteresting. (My wife claims I am too easy with film reviews; I disagree - see for example my reviews of A Slipping-Down Life or Last Night - but I guess I certainly am critical of food!) Yesterday, we had the great luck to see the Monet in Normandy exhibit; after going through the fifty paintings (approximately 5-7:30p), we quickly stepped out to Whole Foods for dinner so that we could come back for about 15-20 minutes to see the paintings again. Today, my wife is away, working in Charlotte about 2 1/2 hours away. Maybe because I was left wanting Sunday night, I decided to make a noodle dish for myself. I let hot tap water run till it was hot enough to be uncomfortable to the touch; I filled a bowl with the quite warm water and soaked Thai rice noodles for 5-10 minutes till the noodles were softened, then rinsed them in cold water and drained. In the meantime, I started sauteeing an onion cut into half moons, adding tempeh chunks a few minutes later. I sauteed well, probably for 10 minutes. Near the end, I added Lombardo peppers and the garlic they were marinated in, as well as about a third of a jalapeno pepper, sliced, and diced ginger. I stirred, then added the drained rice noodles and soy sauce, stirring for another 1/2 or 1 minute, and served. 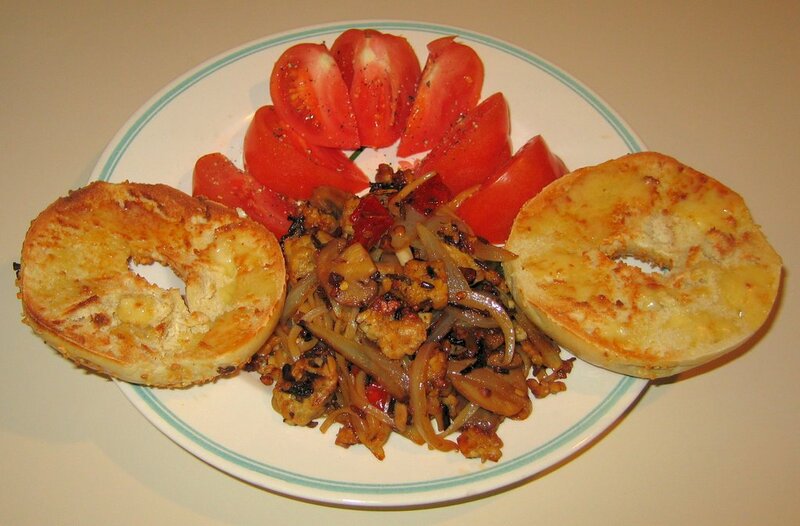 Originally, I had planned an Italian dinner and was going to serve some fresh garlic bagels that I had bought today. But since my wife was away, I thought I'd hold off on that dinner. But I couldn't resist one of the bagels, though it didn't really match the cuisine. But it all tasted good and was nicely filling! Last night we ate out with my parents, sampling dishes at a restaurant for possibly ordering catered food. I don't eat Indian food very often, in spite of the fact that my parents are immigrants from India. Because I grew up with my Mom's excellent (North Indian) cooking, I find that I am often disappointed with eating out at typical North Indian restaurants - but love South Indian (with rice and lentil dishes like dosa, uttapam, idli and sambar, ...) ones. Anyway, I was looking forward to cooking last night but my Mom wanted to consider having some North Indian food catered for their upcoming anniversary, and we visited a nearby restaurant (Tandoor). It was more disappointing than I expected and was perhaps my worst restaurant experience in a few years. After enjoying First Night Raleigh on New Year's Eve, we had a late night (approx. 2-3a!) visit with our neighbors. Originally from the Caribbean, they had a few plantains and sent us home with, among other items, two plantains. Today I made a very simple dish with one of them; I sauteed the thickly sliced plantain and served it over Himalayan red rice, with a little bit of salsa on top. I also roasted organic bi-color corn. My wife and my parents organized a very nice surprise birthday party for me a few days ago. I love food at Café Parizäde, and they not only had a nice party at my parents' house, but told our friends at the restaurant to send some food over for our party. They're great and need no further instruction - they made many good dishes, including my limed seitan that they also had made at Thanksgiving this year, my favorite dish at that event, and a nice peanut butter-chocolate cake. There's significant leftovers, so today I made my first dent at using them. 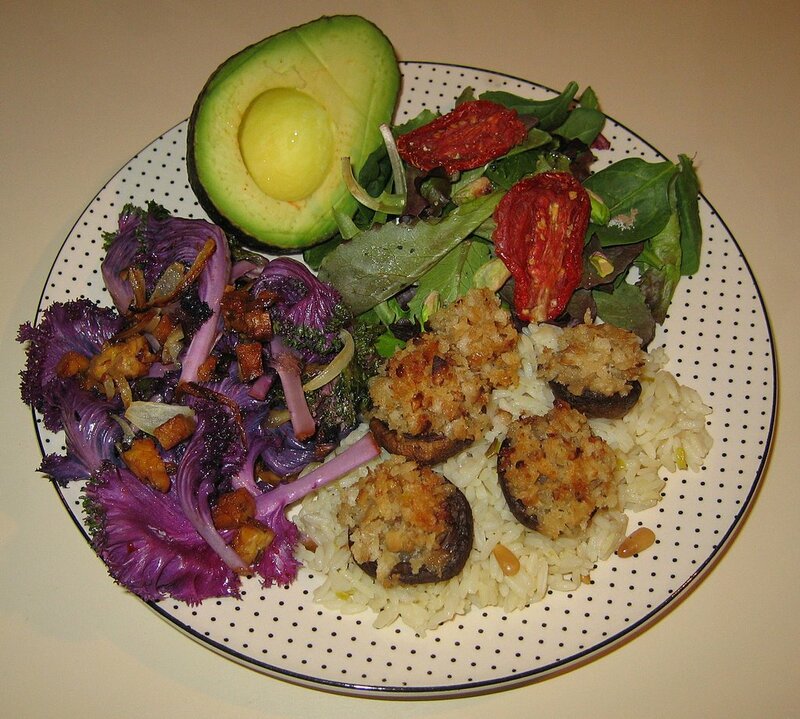 I heated in my rice cooker for a few minutes some nice rice with pine nuts and stuffed mushrooms. I also made a simple stir fry of ornamental kale with tempeh and onion, adding some ginger, green chili pepper, and soy sauce just before serving. I also included pistachios and sundried tomatoes in a salad. The meal was good and filling! By the way, I have a large slow cooker in the attic that I've never used, and for my birthday, I received a compact 120-watt 1.5 quart Chefmate brand slow cooker with a removable ceramic insert, three heat settings (low, high, and warm), and glass lid. I'm excited because it is small enough that I can find space in my kitchen for it, and it's big enough to make dishes for at least two. So I'm going to experiment with slow cooking, starting with ideas from recipes I can find, such as a vegetable barley soup, a mushroom-wine sauce over pasta, smashed sweet potatoes with cranberries, and many ideas from the Just Slow Cooking website. 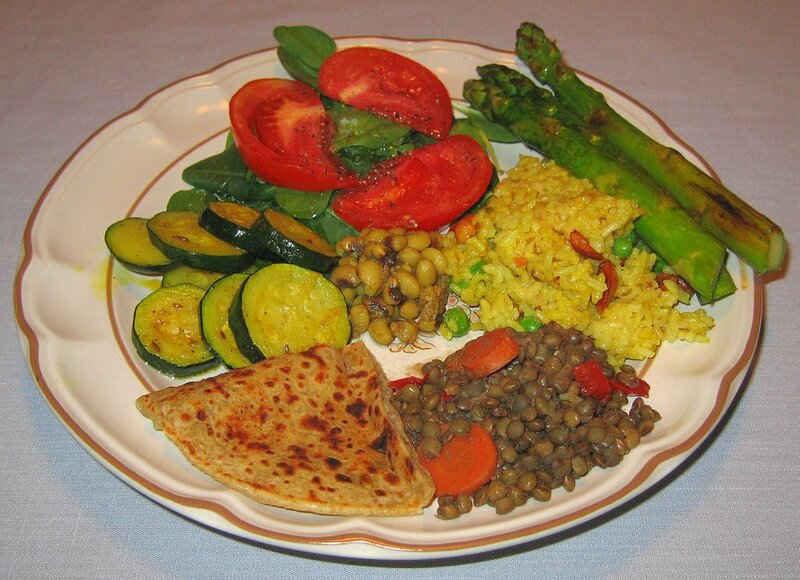 Indian Dinner - Rice & Green Pea Pilaf, French Lentils with Vegetables, Curried Zucchini; Question: what is the difference between fruit & vegetable? Happy 2007! My Mom is a great cook and prefers eating at home. It's difficult to get her to try new things or even eat at my house, but I was surprised when she called earlier wanting to get together and when I asked if she would come for dinner, she said yes! She doesn't eat onions or garlic; my Dad doesn't eat garlic. So I made an Indian dinner - the first time for my wife. I made a rice and green pea pilaf, French lentils with carrot and bell pepper, and curried zucchini. I also grilled asparagus and served a salad, plus two items that my Mom brought over, a single Indian roti bread to share, and black-eyed peas that she said are traditionally eaten on the first day of a new year. 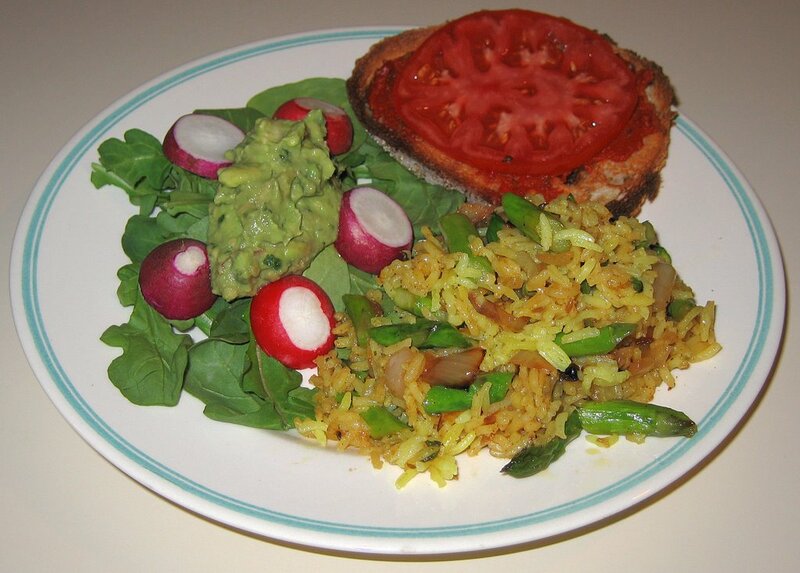 The rice is a minor modification of a recipe that I teach my students. I cleaned a cup of white basmati rice, swishing it around in cold water and draining starchy water several times, then soaking for 10m or so in warm water. I heated in a nonstick sauce pan a little bit of canola oil and quickly, over medium heat, browned a quarter or third cup of raw cashew pieces, stirring/shaking and removing after only a minute or two, before the nuts burned. Then I wiped the pan down, put fresh oil in, and, over medium-high heat, a teaspoon of cumin seeds, most of a medium hot green chili pepper, finely sliced, and about 1/2 tablespoon of minced ginger root. I stirred for half a minute, minding that the cumin didn't burn, then added the drained rice, stir frying for 2m or so. I then added 1 3/4 cup water, a teaspoon of turmeric, and 1/2 teaspoon each of garam masala and salt. I brought the rice to a boil then reduced to a low simmer, covered, for about 15m. I quickly removed the cover (basmati cooks nicely with steam, so it should stay covered), added 3/4 cup of peas, and sometimes let the rice cook for another 5-10m, but it seemed done, so I just kept it covered without heat for abou 10m, and stirred the cashews into it before serving. For the lentils, I simply added 3 times as much water as lentils into a pan; normally I'd also add a bouillon cube, but it would have onion in it. I also added a sliced carrot and finely chopped red bell pepper, plus a pinch or two of salt. I brought it to a boil and then simmered for about 20 minutes. The zucchini was also easy to prepare. I thinly sliced zucchini and sauteed in a little bit of canola oil. When the zucchini was just barely starting to brown, I added a little cumin seed, turmeric, and asofotedia powder (it's easier to call it "heing", the Hindi name). Asofotedia powder is a staple in the pantry of those Indians who don't eat garlic, and it also has a somewhat strong flavor, stirred, and served. A fruit is actually the sweet, ripened ovary or ovaries of a seed-bearing plant. A vegetable, in contrast, is an herbaceous plant cultivated for an edible part (seeds, roots, stems, leaves, bulbs, tubers, or nonsweet fruits). So, to be really nitpicky, a fruit could be a vegetable, but a vegetable could not be a fruit. I wonder what would be an example of a non-sweet fruit? And what does it mean to not be sweet - I suspect all vegetables have some fructose and certainly carbohydrates. I know that tomatoes are considered to be fruits - and I guess that they would be one example of a fruit that can also be called a vegetable, according to this explanation. dictionary.com cites includes this definition for tomato: "mildly acid red or yellow pulpy fruit eaten as a vegetable". I wonder what it means to eat something "as a vegetable". Are there other examples of non-sweet fruits? I know that avocado is considered a fruit. In doing a little research, I also found that pumpkin, pea, bell pepper, cucumber, olive, zucchini, and squash are also fruits. Fruit is the matured ovary of a flower, containing the seed. After fertilization takes place and the embryo (plantlet) has begun to develop, the surrounding ovule becomes the fruit. ... [there are] four types of fruit--simple, aggregate, multiple and accessory--which explain things like berries and pineapples. A grain is described as the dry fruit of a cereal grass, such as the "seedlike fruits of the buckwheat and other plants, and the plants bearing such fruits." So, grain is also a fruit. The difference between a fruit and vegetable depends largely on your perspective. From a botanical perspective, a fruit is the mature ovary of a plant, such as an apple, melon, cucumber, or tomato. From the common, every day "grocery store perspective," we tend to use the word fruit with respect to fruits eaten fresh as desserts - apples, peaches, cherries, etc. - and not to items cooked or used in salads. So, tomatoes tend to be lumped in with vegetables because of the way they are used (cooked and in salads), but botanists will call them fruits because they develop from the reproductive structures of plants. The California legislature once passed a law declaring tomatoes a vegetable in order to impose a tariff on Mexican imports!